Preventive maintenance is a schedule of planned maintenance actions aimed at the prevention of breakdowns and failures and should be at the heart of any maintenance program. It has been proven again and again that sporadic ongoing repair leads to asset deterioration, a shorter asset lifetime and increased long-term capital cost. The primary goal of a preventive maintenance program is to prevent equipment failure before it actually occurs. Standard preventive maintenance checks increase the lifetime of your assets; reduce the need for repair or replacement, and thus a healthier bottom line. Simply put, they keep your assets in control. 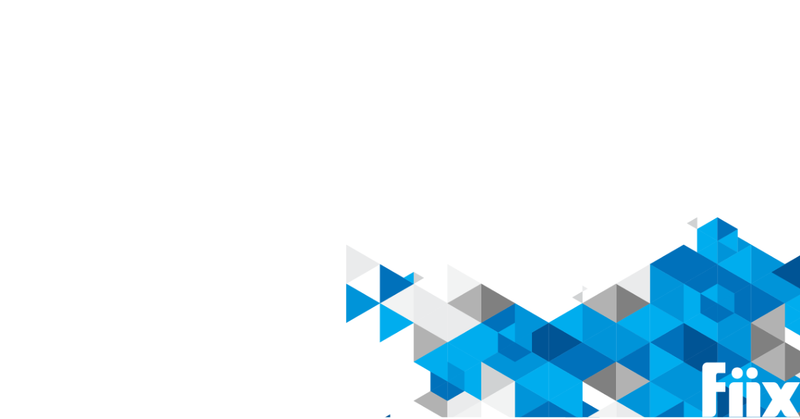 In many organizations, PMs become a lower priority over time. One of the excuses for skipping PMs or not performing PMs on time is the unavailability of labour due to emergency repairs. As the time required attending emergency repairs increases, the time available for PMs decreases and more and more are postponed or skipped. 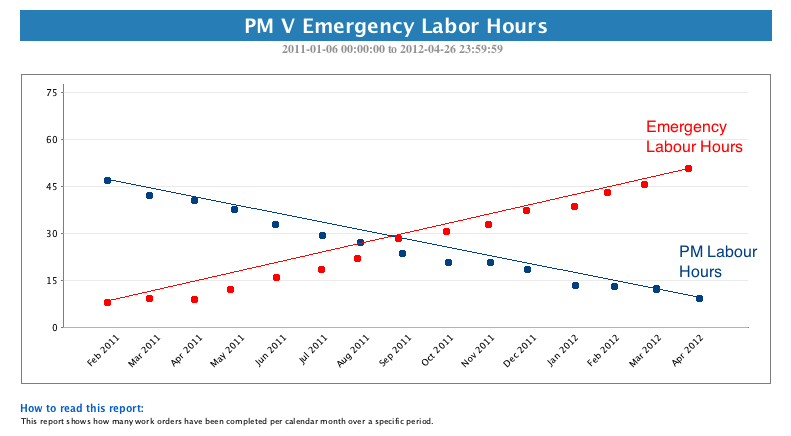 Compare the labour hours spent on unscheduled repairs versus the labour hours spent on PMs. If your unscheduled repair labour hours are high and your PM labour hours are low, then either you are not performing your PMs on time or not performing them at all. It is difficult to get out of this downward spiral unless you step back and develop a plan to get emergency repairs back under control. Your preventive maintenance program is failing if your maintenance guys are fighting fires when they shouldn’t have let the fires start in the first place. A good CMMS enables the facility manager, subordinates and customers to track the status of preventive maintenance work on their assets and the associated costs of that work in one comprehensive system. The CMMS also helps track checklists in your preventive maintenance procedures. Checklists ensure the work is completed in a defined order and nothing is missed. A simple way to improve your asset availability and reduce unscheduled repair is to work to the 10% scheduled maintenance rule for time-based PMs. Basically, the 10% rule states that a preventive maintenance action should be completed within 10% of the scheduled maintenance interval. For example, a quarterly PM every 90 days, should be completed within 9 days of the due date or it is out of compliance. The 10% rule helps keep your PM intervals constant, reducing the time variable variation, thus improving reliability. Feeding all maintenance information directly into a CMMS solution facilitates the automatic manipulation of data to enable operational, technical, and economic analysis such as repair vs. replace. It also generates reports that provide evidence of effective maintenance. 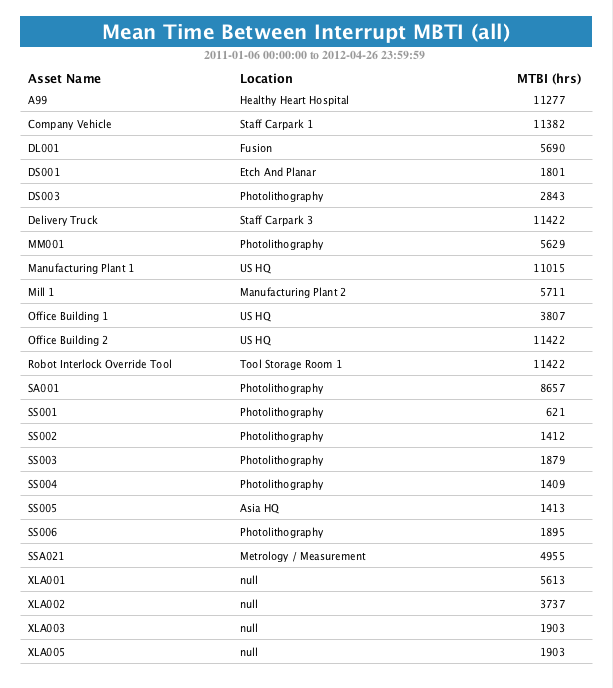 A CMMS also gives you information about your key metrics, or KPIs. Key metrics like Meantime Between Failure (MTBF), PM compliance, Critical % should always be captured, recorded and looked at for trends. Metrics demonstrate how effective a preventive maintenance program is. MBTF can help you identify your worst performing asset so you can get a handle on it and get it back under control. Simple analysis like this, in turn, provides knowledge of equipment failure behaviour patterns with respect to other external and internal factors such as “working” age, PM frequency, EHM parameters and decision models, operational tradeoffs etc. We can then use this knowledge to improve system availability and ultimately, the company’s bottom line.